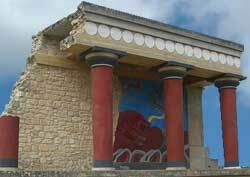 The Knossos Palace gives us an insight on the ancient Minoan Civilization, which was a Bronze Age trading power. It had a vast mercantile fleet with far-flung trade routes that reached more than a thousand miles from Greece. Knossos Palace was likely the governmental, cultural and religious seat of the Minoan Civilization of Greece, which began around 2,000 BC. Knossos Palace likely had over 1,300 rooms. Among those that have been restored, the Throne Room is the tourist favorite. He fell into the sea and drowned when trying to escape the palace because he flew too close to the hot sun. His artificial wings dropped off when the wax securing them melted. This half-man, half-bull monster lived and was slain in the stronghold's labyrinth.